1 Farmers use sustainable production methods. 2 Greek tomatoes grown in a free from pesticides environment. 3 Greek tomato units use controlled production methods. A strong demand in the market for new types of tomatoes with high quality and added-value, has prompted Greek businesses to differentiate to get certain internationally recognized certificates.”Traceability is also very important. Consumers are nowadays well informed on food quality and each product’s organoleptic characteristics, and they are really intent on knowing what exactly is on their table, its source, its production process. 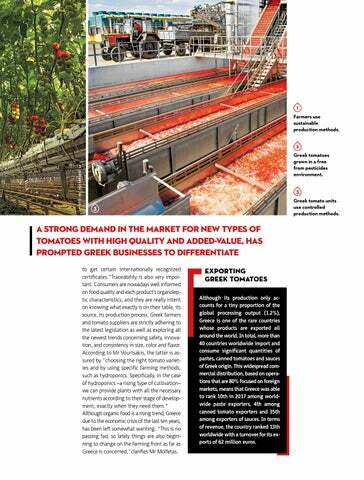 Greek farmers and tomato suppliers are strictly adhering to the latest legislation as well as exploring all the newest trends concerning safety, innovation, and consistency in size, color and flavor. According to Mr Vourtsakis, the latter is assured by “choosing the right tomato varieties and by using specific farming methods, such as hydroponics. Specifically, in the case of hydroponics –a rising type of cultivation– we can provide plants with all the necessary nutrients according to their stage of development, exactly when they need them.” Although organic food is a rising trend, Greece due to the economic crisis of the last ten years, has been left somewhat wanting. “This is no passing fad, so lately things are also beginning to change on the farming front as far as Greece is concerned,”clarifies Mr Molfetas. EXPORTING GREEK TOMATOES Although its production only accounts for a tiny proportion of the global processing output (1.2%), Greece is one of the rare countries whose products are exported all around the world. In total, more than 40 countries worldwide import and consume significant quantities of pastes, canned tomatoes and sauces of Greek origin. This widespread commercial distribution, based on operations that are 80% focused on foreign markets, means that Greece was able to rank 10th in 2017 among worldwide paste exporters, 4th among canned tomato exporters and 35th among exporters of sauces. In terms of revenue, the country ranked 13th worldwide with a turnover for its exports of 62 million euros.